April | 2011 | Run. Work. Live. Repeat. Sometimes you find motivation to run in the strangest forms. Mine today came on the treadmill while I watched TV at the gym. I stayed on so I could see Princess William and Kate Middleton kiss after their wedding. That’s one of the few things I like about running indoors. Watching TV news while I run provides me with book-ends to remember world events like today’s. My gym has a 30-minute limit on all the machines. I asked the guy working at the desk, who’s also a friend of mine, to extend my time so I could witness the William and Kate smooch seen ’round the world for myself. He laughed and rolled his eyes at me when I told him why. Sure, he was right. William and Kate appear to be a modern couple in the most plain sense. Plus, the actual puckering up would only last a few seconds. That was beside the point, however. By now I was hooked. The build-up had sucked me in. The recap of the wedding was on all the TV stations when I got to the gym at 5:45 a.m. Call it Will and Kate plus 88 — MILLION VIEWERS that is (or some crazy number like it). I also admit, before this morning, my Inner-Cynic Girl rolled her eyes at this whole royal nuptials business. Witnessing too many not-so-happily ever-afters does that to a sane, middle-aged person over time, or at least it’s done it to me. Many of my other female friends, however, gushed about it. Several even planned to get up in the wee hours wearing tiaras themselves to watch it live and channel their inner-princesses. Then today’s broadcasts rolled around. I made Inner-Cynic Girl take the back seat. I found myself glued to the TV as I logged the miles. 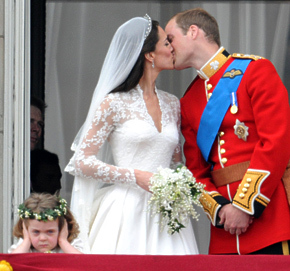 The sincerity on William and Kate’s faces struck me as I watched them say their “I do’s” before the masses. Behind all the pomp and pageantry I saw two young people trying to make it — their shot at happiness today and whatever comes next. They came off like real people, not just royals. We’ll never know for sure if it’s true or not, unless William and Kate confirm it. My guess is they won’t but I’d like to believe it’s true anyway. Finally they kissed came and I got off the ‘mill. I logged four miles waiting to see it. It’s hard for anyone getting married to make a-go of it. Life makes no distinctions between royals and commoners when it comes to throwing curve balls. I really hope they adore each other as much as they seemed to in front of the cameras because once the champagne flutes are put away the challenges will come. An old friend of mine and I were talking about that very thing today — the stresses that happen once “happily ever after ” begins — for many of us that means the finding the balance between child-rearing, jobs, time with spouses and for ourselves. Let’s just hope William and Kate put as much thought into that as they did into the guest list — or better yet, even more. Here’s a tribute to the royal newly weds — Faith Hill’s classic This Kiss . In what other sport can you compete in the same arena with the best? Haller, 38, is a stay-at-home mom to two boys, ages 6 and 4. Like me Carey ran her first Boston Marathon last week, and when she qualified, she just made the cut-off for her age group, running a 3:45:47 at the Boulder Backroads Marathon in 2010. (Her age group standard was 3:45:59). Carey, who said she’s been a runner all of her life, is from Gaylord, Michigan. She was inspired to run by her father, who competed in local races in Michigan when she was growing. Her dad, now in his 70s, doesn’t run anymore. He bicycles instead, but he left his running legacy with her. Carey competed in track in middle and high school. She stopped running in college, but took it up again later in her adulthood. Carey and her husband relocated to Colorado from Michigan a few years ago. A big reason they choose the area was for the healthy lifestyle they saw out west. Her husband, who’s also a runner, is an engineer with Lockheed Martin. They picked their neighborhood for its proximity to running and bicycling paths. Boston was Carey’s fourth marathon. Her first was the Detroit Marathon, which she ran before she had children. She ran the Denver and Boulder Backroads marathons after moving to Colorado. Although there was nine-year hiatus between when she ran the Detroit and Denver marathons, she used the same type of training plan for both — the Hansons Running Shop method. It stresses speed and tempo running but individuals never run more than 16 miles for their long weekend runs before racing. The plan, however, includes longer-type distances back-to-back on the weekends; for example, a 16-miler on Saturday followed by a 10-miler on Sunday. Carey said the method worked well for her and she liked it. Plus it fit in with family schedule and obligations. “I’ve heard it said it takes a strong person mentally to follow it because it’s lower mileage (than other plans) but you do speed and tempo work,” she said. When she qualified for Boston at the Boulder Backroads it was exciting, she said. It wasn’t until she neared the finish that she realized she had done it. Her family was watching her and it gave her the push she needed to do it. The marathon is a similar battle, she said. Carey ran 3:57:15 at Boston last week. She wants to run the Big Sur Marathon next. She’s also started a children’s running program at her local recreation center. She will be the coach. The focus of the program is to promote youth running and racing by playing games with the children — relays, red rover, tag. etc. Who knows? Maybe through the program she’ll inspire the next generation of future Boston Marathon qualifiers to run with the best, just as she got to do recently. Part one, I shared what it was like leading up to the race and the atmosphere in Boston. The following is my race day report and the nitty-gritty of what I got to experience. I rarely sleep well before a big race. Boston was no exception. I got to bed around 10;30 p.m. Sunday and I slept fitfully until 4 a.m. I drifted back to sleep around 5:30 a.m. My alarm went off at 6:15. I brewed coffee and drank some, ate a bowl of cereal and a banana, and got dressed. I packed my dry bag, put on my extra layers, and slipped out quietly as my family, the Dude and Tarzan and Jane, slept. We walked to the Boston Public Gardens to catch the bus to the start. We got there at 7 a.m. and waited for more than an hour. The line behind us snaked several times around the park. The temperature was in the mid-40s. I under-dressed. I didn’t think I would need more layers as the weather was warm on Sunday. Plus I didn’t realize how long we’d be in line. Also, Peter, a friend of Pam’s from her town, was driving the lead car for the elite women’s race. He offered to let us warm up at a house near the start once we checked in at the athletes’ village. Luckily the wind wasn’t bad while we waited. Once we were on a bus I warmed up quickly. It took us an hour to get to the start and the athletes’ village. We arrived past 9:30 a.m. By then the elite women’s race had started and Peter was gone — no more warm house for us. Instead we hung for a bit at the athletes’ village and dropped off our dry-gear bags. We headed toward the start and corrals. It was a .7-mile walk from the athletes’ village to the start in Hopkinton, all on two-lane roads. It was packed with people everywhere. Pam and I weaved our way to the starting line. We watched the second wave of runners start the race. They tossed extra layers off in the corrals. Since I was still cold, I grabbed a discarded fleece and gloves to help me feel better. I saw joy and excitement in the runners’ faces. It choked me up. I began to cry. In 15 minutes it would be my turn. I was finally running Boston! We got into the corrals shortly after those runners were gone. The minutes flew by. Before I knew it we were off and running, too … yippee!! Pam and I talked about my expectations in the days leading up to the race. I have several friends who’ve run Boston before me and they told me it was a tough course. None of the hills are that steep themselves but it’s the combo that gets to people — downhill at the start and uphill near the very end (the most challenging hills at miles 16, 18 and 20) — a true quad-thrasher if you aren’t prudent. 2. To run the whole way strong, period. That’s why I went out conservatively. If by chance I felt strong and could run faster later in the race, great. If not, steady and strong was enough for me. It was so crowded at the start it was easy to hold back. From start to finish there was a wave of people in front of us the whole time. The same went for the spectators. 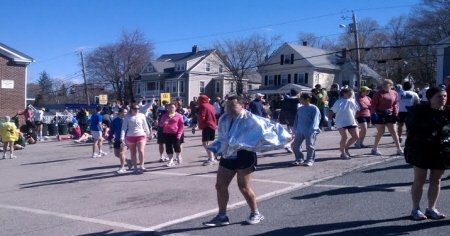 There were people cheering for us the ENTIRE 26.2-mile stretch. Like I said in yesterday’s post it made you feel like a rock star. I tossed off my extra layers of clothing during the first two miles. We worst thing we saw during the race happened in the first mile. One woman took a face plant. She was bloody when we passed by her. We high-fived so many children!! The first four miles were easy, downhill. I consciously held back and didn’t run too fast. A group of bikers cheered for us at mile two and we warmed up quickly in the sunshine. Pam and I chatted and soaked it in. At mile six she asked for a potty break. We stopped. I ate my first PowerGel while I waited for her to finish. Then we picked it back up again. Going into Natick, around miles 8 and 9, we looked for Hilary — a college friend of mine — in the crowds. She spotted us but I never saw her unfortunately. “You looked great, running strong,” Hilary told me later after the race. We also looked for Faith Mazdar, who knew Pam’s friend Peter, the guy driving the lead car for the elite women. She had made a sign with our names on it. That is something no one had ever done for me before Boston — made a sign for me. We saw Faith around mile nine and stopped to hug her and take pictures. I got these two shots from someone who knew Faith. Unfortunately my cell phone’s battery was low and I lost some time here mucking with my camera on it. Faith pronounced my real name perfectly. It turns out she grew up knowing another Slavic woman named Danica — very cool coincidence. Faith handed us bananas, which we gobbled up as we kept moving. Around mile 10 Pam and I ate popsicles a little boy gave us. They tasted sweet and refreshing as we ran. We passed a little lake past Natick and kept cruising. Pam chatted with a man who was in his 70s next to us. He was running his third Boston — also very cool. Next came Wellesley and the famous scream tunnel. “The girls are so loud, it’s crazy,” Pam warned me. She wasn’t kidding. The excitement was deafening. You could hear the girls before we got there and after we passed. I lost count of how many Wellesley girls I high-fived. “Do you think they go hoarse after the race?” I asked Pam. “Nah, they’re young,” she laughed. We passed a lot of typical New England houses along the way — white siding, black trim, colonial style, and many New England churches — brown brick outsides, tall steeples. Those moments felt like a series of Thomas Kinkade paintings. The Newton city sign around mile 15 broke that enchanted spell for me, but just for a bit. 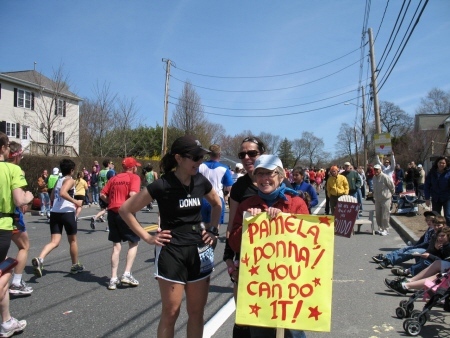 Pam ran Boston in 2009 so she had experienced the course. Not too bad, she told me, just do one at a time. I felt good on the first (mile 16) and still decent on the second (mile 18). At mile 20 there were photographers. A guy running near us pulled out a plastic bag with something in it. He waved it to the cameras. “You might want to shower first,” Pam shouted back his way. Some people laughed around us. We got to Heartbreak Hill between miles 20 and 21. I felt winded, really winded on it, but I kept moving. Between Pam’s encouragement and the spectators I crested the top and did it. Pam and I have a history of running races together where I’ve ended up swearing like a sailor when I’ve felt exhausted. 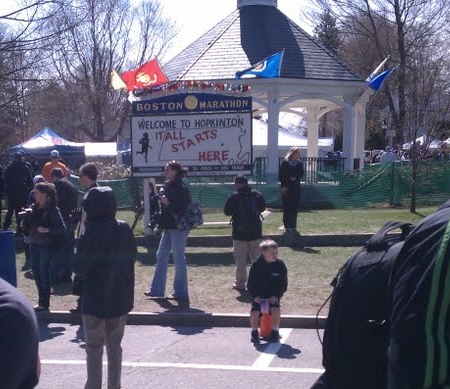 The stretch into Brookline (mile 22) seemed brief in comparison to Heartbreak Hill. I felt myself surge when we entered Boston. “That was a fast mile,” Pam told me. Between miles 23 and 24 I felt my quads cramping and my legs getting tired. We were so close! Fear, pain and doubt crept in and I began to dig deep. I got really quiet while Pam kept talking me through it. “I will not stop! I will not stop!” I repeated in my head. My mind and body battled each other now. I slowed down briefly during a few of the last water stops but I willed myself to KEEP running. I listened to Pam and the shouts from the crowds to distract myself. And I prayed for God to give me the will and strength NOT to stop. Pam pointed out the Citgo sign when it came into view. Pam also noticed a poster in the crowds that triggered deep emotion for her. She shared a personal anecdote about it and she began to cry. I reached over to hug and comfort her as best I could while we ran. A mile or so later, a huge wave of gratitude swept over me when we hit mile 25. Now I knew I would make it somehow. I trudged throught the last mile. There was one last left turn and we were on Bolyston Street — the finish line was now ahead of us. Pam grabbed my hand. We raised our arms together and crossed the finish line. The Dude and Tarzan and Jane were at the finish line and saw me. I didn’t see them. My sole focus was forward momentum. I didn’t notice much else. Pam and I started to walk after the finish line. We didn’t get far when waves of nausea and needing a bathroom quickly hit me. I stopped to sit down. I tried but couldn’t. I felt woozy. A volunteer took me into the medical tent. I needed a bathroom immediately, I told the woman. She got me to one. After I went to the bathroom, the woman sat me down on a cot and put a foil blanket around me. I need something to drink and eat, please, I told her. Some people took my temperature and blood pressure. They got me food and Gatorade. I ate and drank some and I immediately felt better. Pam and I left soon after that. Even though I drank and ate the whole time while we ran, I think the intense sun got to me. Near the end I was pouring water over my head to keep cool. Pam and I walked the half mile to get our dry bags. Then went back to our hotels. My family greeted me with a huge welcome. 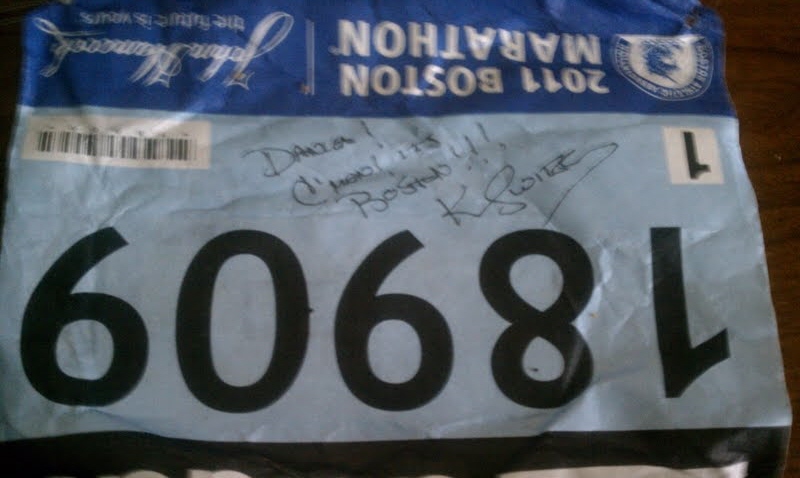 While I could have done without feeling a little off after I finished, Boston was totally worth it. I will treasure it forever. Boston miles logged: 1,636 + 241 donated miles; total 1,877!! I’ve never been a talented singer, but I can imagine how cool it must be to be a rock star now that I’ve run the Boston Marathon. 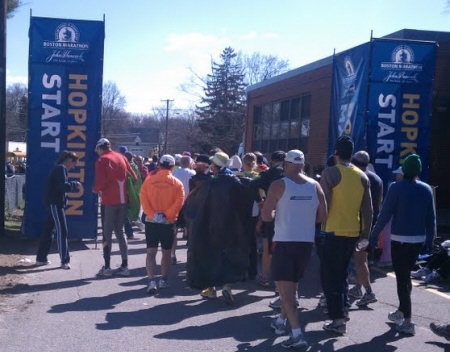 For me the 26.2 miles from Hopkinton to Boston were like American Idol meets Endurance Girl. That’s how wonderful the spectators are at Boston. The crowds who cheer for the marathon runners each year are the true endurance athletes. THEY carried me and so many others to the finish when I ran the marathon on Monday. 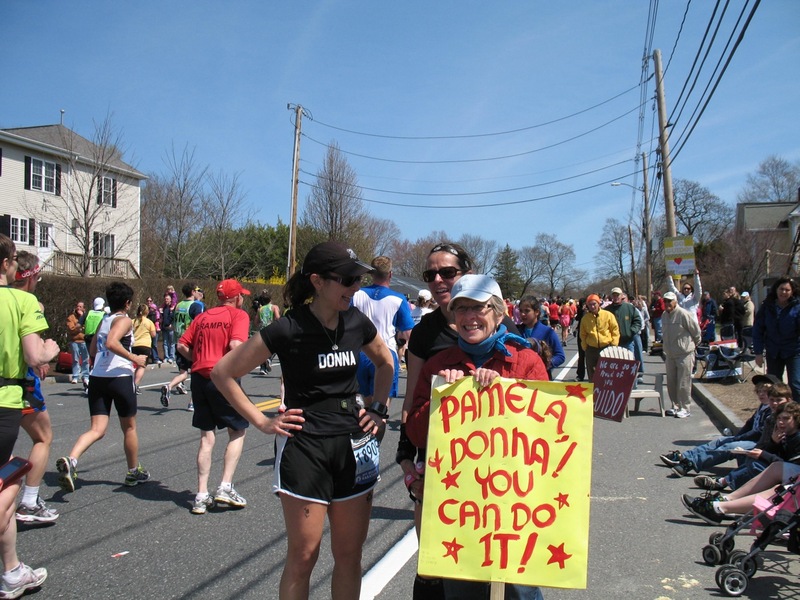 My Boston recap goes out to them and all who’ve supported me with love and gratitude. I would not be here now without you and God’s blessings. Running Boston was everything I hoped it would be. My family and I arrived in town late Saturday night. We stayed within walking distance from the finish at the Marriott Copley Place. From the moment we landed the marathon’s presence surrounded us. There were signs up for it at the airport; people milled about in our hotel lobby wearing official Kermie-green jackets, crowds were out at midnight around Copley Square. We got to bed as soon as we could and we slept in on Sunday. After breakfast we met up with my friend Pamela Geernaert and her family at Hines Convention Center where the race expo took place. 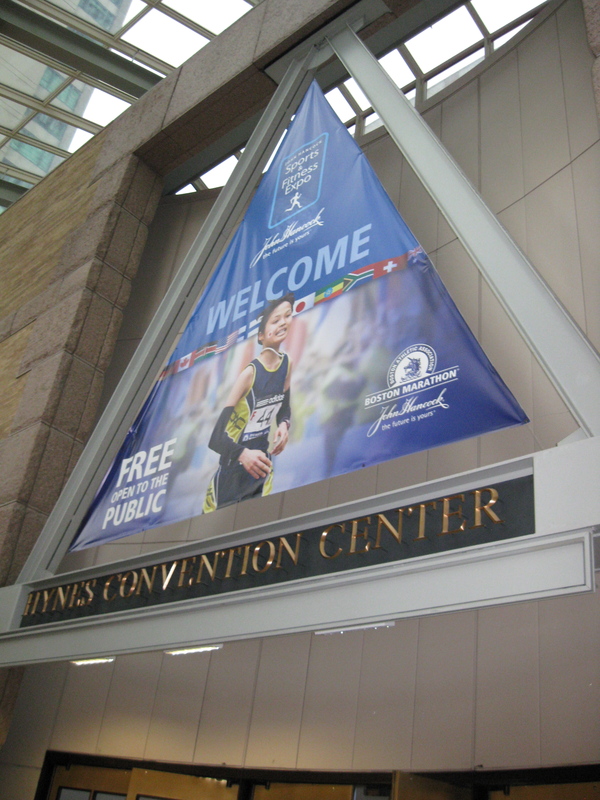 The Boston Marathon expo was like most race expos except on steroids. Actually EVERYTHING about Boston seemed bigger-than-life. The hundreds of vendor and demo booths. The thousands of slender bodies clad in tech racing shirts and sensible shoes. The huge signs all around the city. I felt like a carnival pony amongst sleek thoroughbreds. Holy cow — I had arrived! My number was 18909, first corral in the third-wave to start the next morning. Pam, number 11130, was in the second wave but she wanted to run with me even though it would mean starting 20 minutes later on race day. “You’re slumming it.” I joked with her. 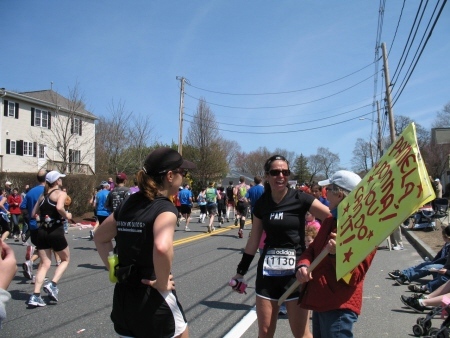 When I qualified for Boston on Dec. 6, 2009, at the California International Marathon, it was on Pam’s 42nd birthday. 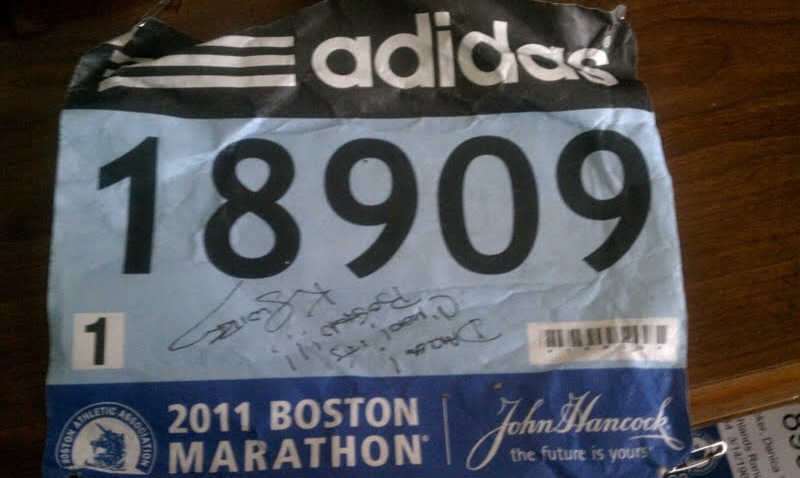 She had already qualified and run Boston in 2009, but she pledged to run it with me after I qualified. At the expo Pam and I picked up bib numbers with our families and then we met up. We waded through the crowds and booths together. 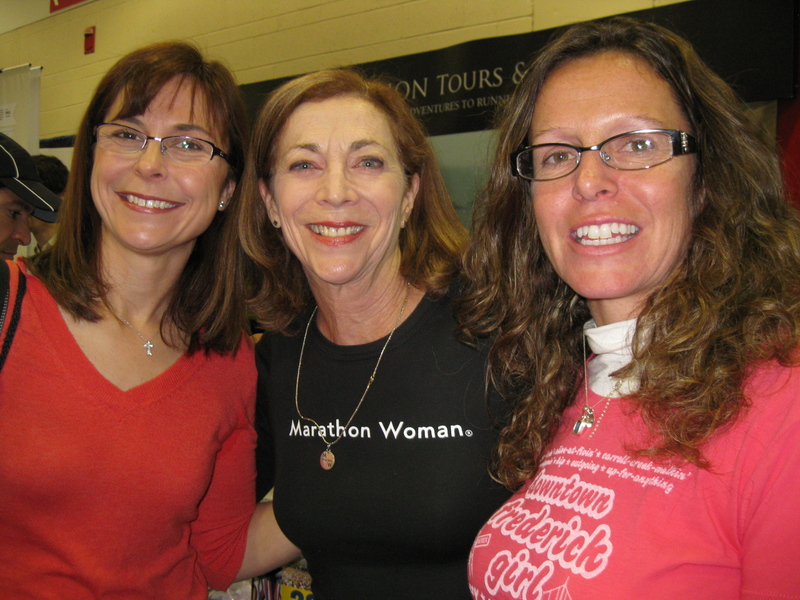 Kathrine Switzer, the first woman to run the Boston Marathon officially wearing a bib number, was supposed to be there. Kathrine is credited for breaking the gender barrier in women’s marathon running. When she entered the race in 1967 as “K.V. Switzer” the race director tried to forcible pull her from the course. My daughter, who’s in second grade, did a history project on Kathrine and wanted to meet her. Unfortunately Kathrine wasn’t there when we got to the expo. Our husbands and children waited as long as they could stand it but eventually left for lunch. Pam and I stayed. When Katherine returned to the Marathon Tours booth we got in line to meet her. I introduced myself when it was our turn. She remembered me from the emails we exchanged over my daughter’s project. She read my earlier Boston or Botox posts about her. “You’re a really good writer,” she told me. Her words made my day. I bought a copy of her book and asked her to sign it as well as my race bib. We also took pictures with her. I wish Jane, my daughter, could have joined us but my husband and children never made it back to the expo. Pam and I shopped a bit, then left the expo soon after that. I hoped to return after I grabbed a bite to eat. I wanted to meet up with friends I met through the Dailymile.com but unfortunately never made it back after I regrouped with my own family. Once we dropped off gear at the hotel we met up with a friend of my husband’s and headed to Boston Public Garden to ride the swan boat rides with our children. We also met up with a college girlfriend of mine there. Along the way we stopped to look at the finish line and took pictures. The spot buzzed with people and excitement. My family and our friends kicked back at the park. There was also a playgroup for the children. It was a lovely pre-race afternoon outing. Afterwards we headed to a pizza place for dinner where I consumed a mountain of spaghetti for a pre-race carbo-load meal followed by glasses and glasses of water and half of a Coors light beer to help me get to sleep. I dropped off a matching Boston or Botox race shirt to Pam at her hotel room, got my racing gear and clothes ready for the morning, and I went to bed. From there it was another 12 hours until I ran the Boston Marathon. Coming tomorrow, the final race report: Boston Idol, Part II — Race day and 26.2 miles of rock-star status. It’s taking me time to complete my full write-up but I’ll have it very soon. In the meantime, these photos give you a flavor for the expo. Official finishing time: 4 hours, 11 minutes, 21 seconds. 1,000?? — random guess as to how many people I heard shout mine or Pam’s name (our names were on our T-shirts). Two — number of full stops Pam and I made along the course — one potty break, the other for a big hug and photo op with Faith. 3 1/2 — number of PowerGels I ate. 10:40 a.m. — time my wave and corral started. 4 — number of hours I had already been up by then, including one hour wait to get on the bus to the start, one hour bus ride to the athlete’s village and time spent hanging out before it started. 10 — the number of my toenails that miraculously stayed intact from 26.2 miles of pounding!! ZERO — number of blisters I got! Woohoo!! 11-plus — number of times I likely sipped water or Gatorade along the course. 16, 18 and 20 — miles where the hardest hills came in my opinion. 4 — number of downhill miles and potential quad-thrashers at the beginning of the race. 21 — the mile where I conquered Heartbreak Hill — I ran up the whole way! 40 — kilometers — the point in my head where I had to dig the deepest. 26.2 — distance that I ran, never had to walk. 7 — number of marathons I’ve now completed! 4 and 21 — number of planes and number of hours it took my family and I to get home after weather delays and airline craziness in the midwest yesterday AND today. 2 — hours of sleep I got last night from hectic travels home — it made the marathon look EASY! I will do a full write-up on the race tomorrow. I’m exhausted from our travels and I’m now waiting for out lost bags to be delivered. Aging is inevitable, but growing old is a choice. Lace up your shoes and let’s go! Today I DID it! 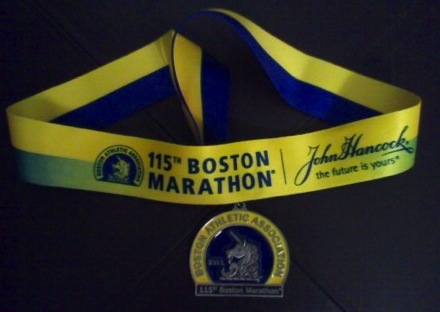 I am a Boston Marathon finisher and I ran the BOSTON MARATHON, even up the infamous Heartbreak Hill. I’ll also do a recap on several friends and people I profiled on Boston or Botox to let you know how they did today. CONGRATULATIONS guys! In a word it was — AMAZING!! Thanks to my wonderful family for making this once-in-a-lifetime trek with me. Thank you today to my wonderful friend Pamela Geernaert for sharing this incredible experience with me. And also thanks to Faith in Natick for her wonderful, heartfelt sign with our names on it and waiting with provisions for us; also to, my incredible friend Hilary for cheering us, also in Natick, too. Also special thanks to HUNDREDS of volunteers and the outstanding people of Boston who poured out by the thousands to cheered us all on the ENTIRE way!! More to come soon! I’m having some tech difficulties but pictures will upload pictures as soon possible! High in the mid-50s, mostly sunny and breezy — that’s the current forecast for Boston on Monday. I’m taking a little of everything to be ready for heat, cold or rain, just in case. Tights and shorts — check. Short and long sleeve tech shirts — check. PowerGels and body glide — check again. Never test anything new on race day — that’s my motto. Only stick to gear and clothes you’ve tried. My friend Pam and I saw her racing a few years ago at the Boulder Backroads Half Marathon, and then again at the Garden of Gardens 10-miler, wearing — you guessed it — a bikini top. Another friend of mine knows Bikini Lady and she told me Bikini Lady is in her 60s and often places in her age group here in Colorado. Now I know what some of you must be thinking. Surely, Danica, your eyes deceived you. Bikini Lady must have been running in a jog bra of some sort, not a true bikini top. Plus, triathletes race in swimsuits. She MUST have been wearing an athletic-cut swimsuit top. I kid you not. It was a bikini top and, and not just a regular one, but a itsy-bitsy, teeny-weeny, halter string bikini top. There was nothing athletic cut about it. This top was meant for sunbathing, not harnessing one’s girls. I’m not sure why Bikini Lady runs it. Perhaps her aim is to be aerodynamic the way the elite women runners race in briefs? Maybe she does it to get attention or just because she can? I don’t honestly know. I can’t imagine one would feel any cooler in a bikini top rather than in a sports bra. Plus, I’d worry about wardrobe malfunctions, road rash if I fell, the sheer bouncy-bounce of it all. Now the next question you are probably thinking, especially if you are a guy is, does she possess the vah-vah–vah–voom to match her zoom and do the bikini top justice? Hmmmm … that’s a tough one. She’s slim enough to wear a bikini, yes, but aging and clothing are a mine field. Some people can pull off some styles better than others as they grow older — the benefit of a lucky gene pool, I guess, while for others it only emphasizes aging. Raquel Welsh, for instance, is one of those with a spectacular set of gene pools at both age 20 and 60. Now if I tried it, I know people would shake their heads and say to themselves, Oh honey, what WERE you thinking? Pulling off such a feat is also about attitude. In Bikini Lady’s case I’d say she has some King-Kong cojones. I admire it about her because that’s what I think it takes to race in a bikini top. Whether you’re 16 or 60, curvaceous as a Victoria’s Secret model or pancake flat like Olive Oil, it’s a bold move. I say if it works for Bikini Lady, good for her and all the power to her, sister. I’m not sure what I’ll wear yet on Monday but it won’t be a bikini top. I think there are some body parts, whether you’re a man or woman, that aren’t meant to be exposed and jiggled violently in the elements. (That’s why Body Glide was invented.) Running 26.2 miles fully and properly clothed will be challenging enough for me. No, it’s not Bikini Lady’s attire I’d like to borrow. The attitude behind those King-Kong cojones, however, could come in handy, especially during those last few miles where it’s not about what you’re wearing on the outside, but donning Teflon armor in the inside. I’m almost done with my packing now. The night before the race I’ll follow another tried-and-true ritual — laying out all my clothes, shoes, bib number and all my gear so I’m ready to go in the morning. Nothing will be left to chance if I can help it. And yes, by the way, I’m packing a bikini, too. It will be for the hotel pool when I’m done racing, not during. I’m almost finished with dress rehearsal. I’ll put on the finishing touches once I get to Boston. Mileage today: 4; Denver to Boston miles logged: 1600; Miles left to go: 170. Exactly a week from today I will run the Boston Marathon along with thousands of other people who’ve also trained hard for weeks and months. That’s what I’m calling these last restless days before the race. It’s difficult to slow down after having worked so hard for so long. No, this kind of PMS is a kinder, gentler one, and fortunately nutritionally conscious and culinarily diverse. This PMS — Pre-Marathon Syndrome — is an equal opportunity employer. It selects female and male athletes equally, not just picks on the girls, and it arrives in the beguiling guise of the MARATHON TRAINING TAPER. For those of you unfamiliar with distance training the TAPER is the final phase before you race where you reel things in — A LOT. You stop running as much and as hard in final days leading up to the event to recover and rest up. You build your reserves for the final push — aka, the race; in this case, Boston. The problem is the TAPER phase is much like breaking up with your first true love — it’s hard to do. Your mind and body have become so acclimated to high mileage and fine-tuned calibration that slowing down is, believe it or not, difficult, especially for us runners. We thrive on endorphins and sweat the way sculptures inject imagination into clay. After awhile pounding the miles is so much of your routine it’s hard to let go. 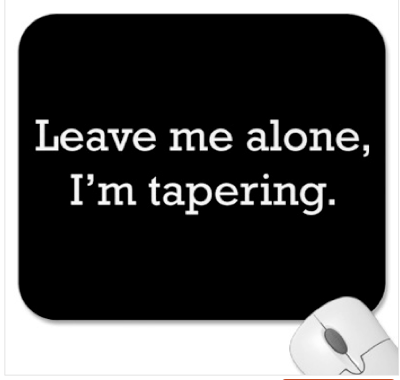 Tapering, however, is a necessary tool and phase in order to keep one’s eye on the prize. I keep reminding myself of this every time a stray carbohydrate attaches itself to my thighs and I’m tempted to veer the course. 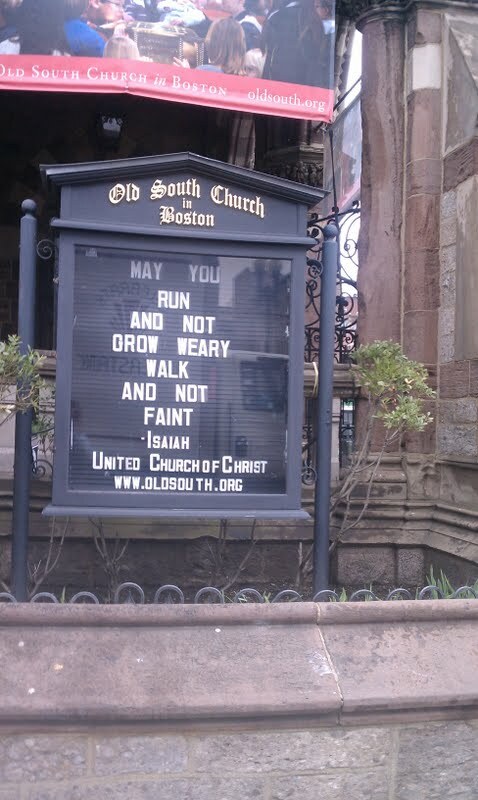 Today as I surfed the blogosphere I found other Boston runners lamenting the same fate. We are all so used to shedding our calories so easily and building our muscles so readily that now we feel like sloughs, but we’re not. It’s what we need to be doing right now. No worries though, folks, the kitchen knives are safe in my home. After an email today from another friend who’s running Boston and feeling the same PMS, however, my supply of Lysol wipes might not be. That’s not a bad idea, and my house could sure use it. The good news is I got to run today — a four-miler. It took the edge off. I have two more runs to complete before I go to Boston. After that it’s show time. Luckily the race will be here soon, and who knows, maybe I’ll get a cleaner house in the process. Perhaps this kind of PMS isn’t such a bad thing after all. Mileage today: 4; Denver to Boston miles logged: 1594; Miles left to go: 176. A few weeks ago I posted the Boston or Botox T-shirt challenge in which I asked five readers to “donate” one week of their mileage to me and I would send them a free Boston or Botox T-shirt. When I created the challenge I had no idea if anyone would respond or if I’d end up wall-papering my house with surplus Boston or Botox T-shirts. Ryan is one of my Dailymile friends and he will run his first Boston next week. A few years ago Ryan lost 135 pounds in the course of 11 months. 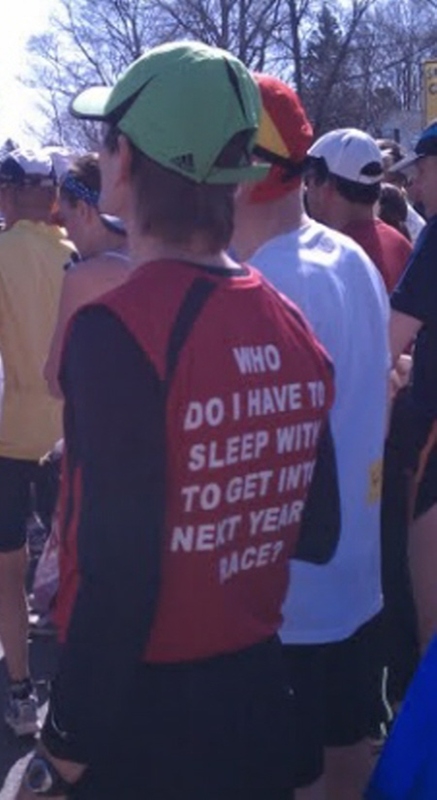 He hopes to finish Boston in under three hours. Roxane is a Boston qualifier, too. 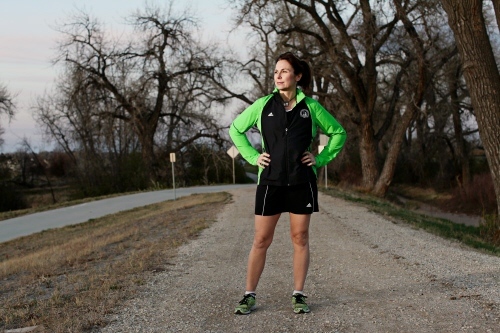 She founded the Highlands Ranch Running Club in Colorado a few years ago and coaches the group. 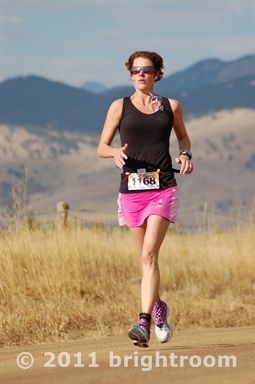 Katie is a member of the Colorado Columbines running club and recently took up racing ultramarthons. 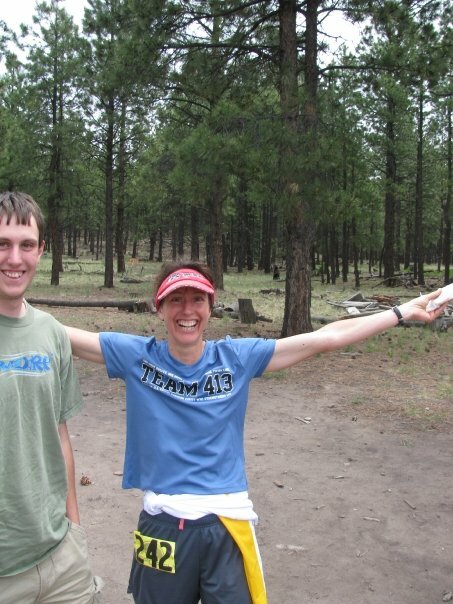 She finished the Rocky Racoon 100-miler in February 2011 in 25 hours, 43 minutes, 16 seconds. 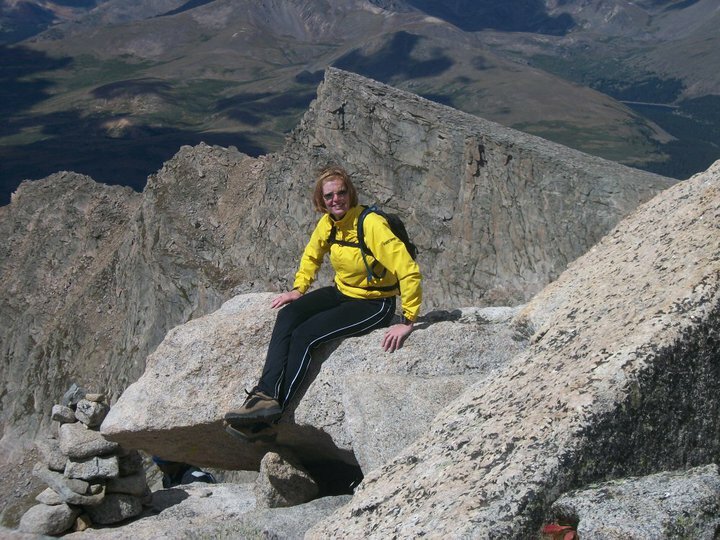 Janet is a member of the Colorado Columbines and the Distance Divas. She has run Greenland Trail 25K Race in 2 hours 54 minutes, 38 seconds and is signed up to run it again this year. 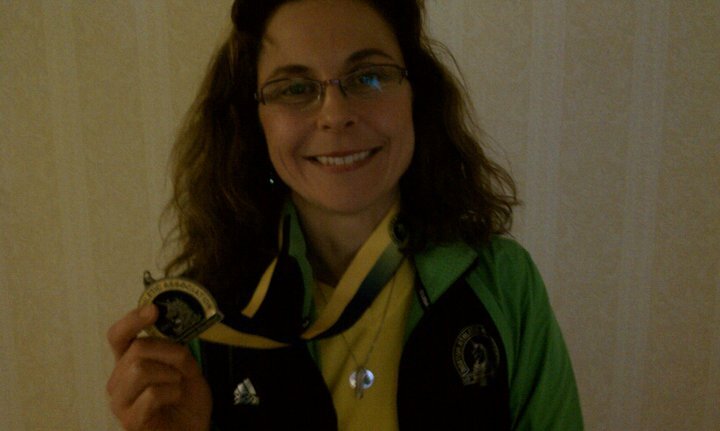 Ruthanne ran the Boston Marathon in 2009 and was second woman overall at Copper Canyon Ultramarathon in 2010. Patty is a certified Stroller Strides instructor, shown here after leading a class. This picture was taken 10 weeks after she gave birth to her second child. When Patty sent me this photo she apologized for her “low mileage” but I think she deserves kudos. She teaches Stroller Strides with a 2-year-old and 3-month-old in tow. The idea behind the challenge was that I knew I was coming close to meeting my goal of running the distance from Denver to Boston (1,770 miles) but I was likely to come up a tad short. I wanted to involve readers on this journey with me and also thank them. My hope was to continue to inspire people and find a fun way to make up my mileage deficit. Collectively my fab five logged an impressive 241 miles (248, if I count Patty’s miles, too) — well enough to put me over what I needed as I’m closing in on 1,600 by myself. Boston is now eight days out! I am gonna rock this one for myself, my fab five and so many others who’ve supported me along the way!